At the turn of the 18th century Chelmsford was Just a small Essex market town located on the main London to Norwich road. Most of its bulk imports were brought by pack mule and heavy cumbersome wagons from Maldon, then an important port, located at the head of the Blackwater estuary. In those days the long, steep slope of Danbury hill, midway between the two towns, with its deeply rutted and muddy road was a frequent obstruction to traffic. In winter the shortage of fuel for fires was particularly serious and local people's minds turned to the possibility of importing coal by water by making the Chelmer - a small river flowing from Chelmsford to the Blackwater estuary - into a navigable waterway. There was some talk of such a scheme at early as 1677, but it came to nothing. The idea was looked at in greater detail in 1733 by John Hoare, a well known surveyor, who estimated that total costs would be about �355. This was thought to be too expensive so it was again shelved. Thirty years later enthusiasm had again grown and this time an Act of Parliament was passed to canalise the river between Moulsham Bridge, right in the centre of Chelmsford to the Fullbridge, Maldon. However, the estimated cost of �,000 could not be raised. Added to this problem was the fact that many of the millers along the course had strongly objected an well as the Maldon townspeople, who rightly foresaw a loss of port dues. However, enthusiasm continued for the project and a fresh scheme prepared. This included a long artificial cut bypassing Maldon completely, to join the river upstream of the town at Beeleigh. On the Blackwater Estuary end, a large basin and entrance lock was proposed. A short channel was also planned at Chelmsford leading into a new terminal basin at Springfield. A fresh Act of Parliament for the project was received in 1793 with the first meeting of the owners of the Proposed navigation - The Company of proprietors of the Chelmer & Blackwater Navigation Ltd - held for the first time on 15th July 1793 at the Black Boy Hotel, Chelmsford. 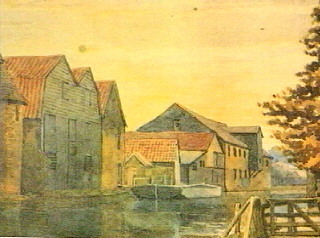 Constructional work started in October 1793 under the general direction of John Rennie, who was responsible for many other contemporary waterways. The design of the locks, bridges and other installations are similar to those on the Kennet & Avon Canal. Day to day control was vested in Richard Coates, who immediately before had held a similar position under Rennie to construct the Ipswich and Stowmarket Navigation, which it closely resembled. He brought with him a large number of experienced Suffolk Navvies to carry out the work. The total length of the waterway was 13.75 miles. This included a number of cuts around the various mills and thirteen locks, built to accommodate lighters 60 feet long by 16 feet wide. The reason why these dimensions were chosen is somewhat uncertain, but it is possible that they were built so that the navigation could be used by lighters already in common use on the estuary. The horsedrawn boats were completely open, flat bottomed, carvel built and incorporated many of the constructional details of Thames barges. Despite having a draught of only two feet, twenty five tons of cargo could be carried on every vessel. At Heybridge Basin, the sea lock was built large enough to allow brigs and other sailing craft to enter the Basin. On April 23rd 1796 the first brig - the "Fortunes Increase" sailed into the basin with a cargo of the best Sunderland coal for Chelmsford. However, the coals were taken only to Little Baddow, from where they were transported by road to the town, the remainder of the Canal not being opened until June 3rd 1797. Springfield Basin was quickly lined with Permanent stone wharves and the adjacent land was soon developed with sawmills, lime kilns, iron foundries, stone masons and coal merchants. The first inland gas works in Britain was built using coal barged up the navigation. In completion of the waterway, Richard Coates settled in Chelmsford and become a major carrier on the navigation. On his death, his nephew, Brown, took over the business. He carried on trading with his son under the name of Brown & Son. Before the Eastern Counties Railway from London to Colchester was constructed in 1843, the waterway carried an immense range of materials and goods of all kinds but once the railway was built a slow decline set in as the rail captured the traffic. However, coal continued to be imported by water until the First World War, mostly for the gasworks, whilst Brown & Son, which had developed into large general builders merchants, continued to bring all its supplies of softwood up the navigation until l972, when, on the take over of the firm, the practice was discontinued and the small fleet of lighters disposed of. 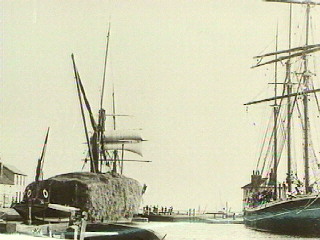 Originally, seagoing vessels would enter Heybridge Basin via the sea lock and unload directly into the Chelmer Lighters. However, early this Century the coasters had become larger and consequently became unable to enter the Basin. Instead, timber, by then the sole cargo, was offloaded from the coasters some way downstream on the estuary to a string of dismasted Thames Barges, which were then towed into the Basin and the timber then reloaded on to Chelmer Lighters. This rather cumbersome arrangement changed in the 1960's when the sea lock was lengthened, enabling coasters to once again enter the Basin. At the same time all the horse drawn lighters - unchanged since the navigation opened - were scrapped and replaced by new motor barges. These rather noisy vessels carried timber to Chelmsford for about ten years. A now unique custom which has survived only on this navigation is for the Directors to inspect the entire canal by boat each year. Originally, they used an ordinary work boat sheeted over for the day, but nowadays a motor boat is used. In 1973 the Inland Waterways Association held a Rally of Boats at Chelmsford, thereby setting the scene for the opening of the waterway for pleasure craft. As a result there are now well over 100 private motor craft of various shapes and sizes cruising the canal. The Canal Company has its own Charter vessel, the "Victoria" and Blackwater Boats offers short break holidays on their small fleet of narrow boats. The waterway is also very popular with canoeists. Still surviving is "Susan", This lighter was built in the 1950's to the traditional wooden design, with the addition of an inboard motor. It was used experimentally by Browns for the carriage of timber before they built an number of steel lighters Propelled by huge "Harbourmaster" outboard engines. These replaced the horse drawn vessels. One of these boats is now used by the Navigation Company as a maintenance boat, whilst the Chelmsford Museum Service are the owners of "Susan", as part of their industrial archaeological collection. With the termination of barge traffic in 1972, Springfield Basin, Lock and Cut all fell into disuse. The lock itself was vandalised and became unusable. The successor firm to Brown & Son demolished the quayside timber sheds. For a time there seemed a real danger that the entire basin would be infilled. However, in 1992 the local branch of the Inland Waterways Association spearheaded the restoration of the basin and in 1993 celebrations were held to mark the anniversary of the date when authority was received to construct the canal and also the long overdue restoration of its terminus. In 1997 further celebrations, organised by the newly formed Friends of the Chelmer & Blackwater Navigation were held at Springfield Basin to mark the opening of the the entire canal, and the passage of the first cargoes into Chelmsford. Possibly the largest number of craft ever to have visited the Basin at one time, assembled by the old wharves over the Spring Bank Holiday weekend.